HR Direction = No strategy and defined outcomes. Digital Capabilities = No internal resources with digital skills to manage and sustain. Low Risk Tolerance = No investment based on perceived short term ROI. Company Culture = No appetite to manage the change. Relevance = The value HR brings to the Business. Difference = The innovative services HR delivers that separates us from the competition. Demand = The insight of change and how it will create or optimize relevance and difference. Big Data = Data sets that reveal patterns, trends, and associations, especially relating to human behavior and interactions. Internet of Things = Network of objects that contain technology to communicate or interact either internally or externally. Machine Learning = Form of artificial intelligence (AI) that provides systems the ability to automatically learn and improve from experience without programming. Blockchain = Decentralized and distributed digital ledger that is used to record transactions across many computers so that the record cannot be altered retroactively without the alteration of all subsequent blocks and the collusion of the network. Virtual Reality = Artificial, computer-generated simulation or recreation of a real life environment or situation. Augmented Reality = Technology that layers computer-generated enhancements atop an existing reality in order to interact with it. We could spend time focusing on how HR is leveraging these innovations, but we will save that for another time. The #1 question HR should be asking isn’t “Should I Stay, or Should I Go”. The #1 question HR should be asking is, How do I get there? 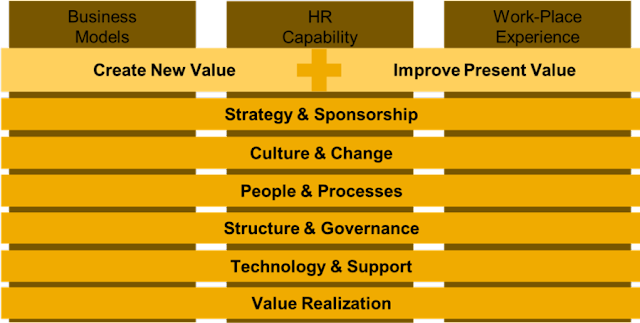 As promised, I am going to provide you with an overview of the the SAP HR Digital Transformation Framework. This framework is not only comprehensive, it has been proven to change the direction of a failed transformation into a successful one. In fact, when followed correctly, it can accelerate your transformation and value realization. What is so special about this framework? Disruption. It was created based on the concept of: ideate + create = realize. We need to disrupt ourselves, before we can transform others!!! The first thing you will notice is there are three pillars. These pillars are the foundation of transformation. They each need to be clearly defined and well rooted before we can begin the planning and execution. 1. Digital HR Business Model: Programs and services HR delivers to the business to drive tangible outcomes & value. 2. 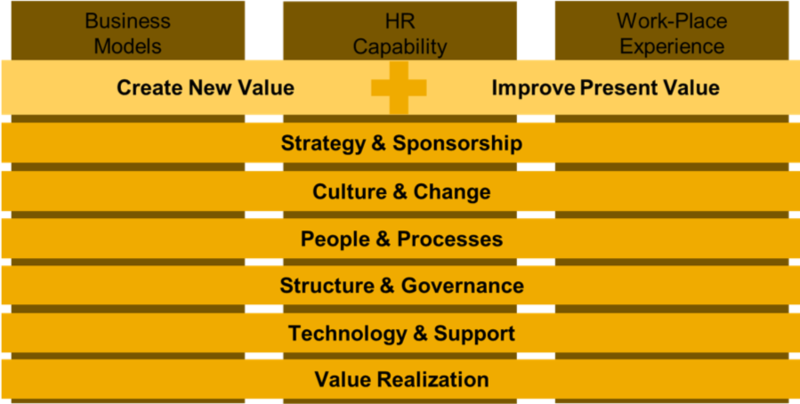 Digital HR Operating Model: Delivery of HR programs, and services with the right people to achieve business value. 3. Digital Workforce Experience: Method by which the workforce consumes HR programs and services digitally. Once the pillars are in place we can begin to move toward planning and execution. 4. Digital HR Strategy: Transitioning HR delivery with digital technologies, i.e. Bot, Virtual Reality, Machine Learning, etc. 5. Digital Sponsorship: Gaining key sponsorship of forward-thinking business stakeholders outside of HR. 6. Change Management: Managing the change of culture, mind-set, behaviors, and expectations of the workforce. 7. Governance: Process of tracking & managing decisions and communications to mitigate risk. 8. Digital Technology: Implementation of digital technology to drive innovation, experience, and adoption. 9. Digital Support Model: The approach for managing & sustaining HR process and technology innovation. 10. Value Realization: Defining and measuring tangible business outcomes & value achieved. The layers of execution is the tipping point for most organizations, because to do this right takes time, effort, resources, and budget. This is the time where HR needs to chose between interest and commitment. Ideate = Disruptive thinking, just because it has never been done, doesn’t mean it can’t be. Create = Bring your disruptive thinking to life. Realize = Don’t settle for interest, commit to achieving your desired outcomes.